Ice Cream is sold (your shop) here! Promote your brand with in-store or out-of-store Ice Cream Banners. Designed by George Dunlap @ C. Nelson Mfg., Co. Oak Harbor, Ohio, USA. Attention to detail by C. Nelson Mfg., CO. Graphics draw your attention. Designed by George Dunlap @ C. Nelson Mfg., Co. Oak Harbor, Ohio, USA. 10DIP ICE CREAM CABINET BY C. NELSON MFG., CO. Call today for your Branding promotional needs. This entry was posted in Ice Cream Cabinets, New Ideas, Promote the Brand, Uncategorized and tagged Artisan Ice Cream, C. Nelson Mfg., Ice Cream Banners, Ice Cream Graphic Design on July 14, 2018 by George Dunlap. 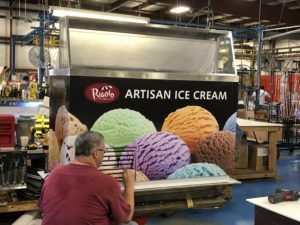 Ice Cream Cabinets for New and Remodel Customers – C. Nelson Mfg., Co.
George Dunlap on Jeni’s Splended Ice Creams and Cakes & Whiskey, great use of social media and C. Nelson in the background. Michelle on Jeni’s Splended Ice Creams and Cakes & Whiskey, great use of social media and C. Nelson in the background.